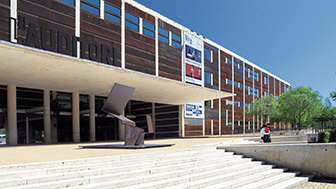 Known as the TNC, the Teatre Nacional de Catalunya was created in the mid-1990s with the aim of providing a space for quality theatre in all fields. Located near Plaça de les Glòries Catalanes, the building, designed by the architect Ricard Bofill, is also of significant architectural interest. 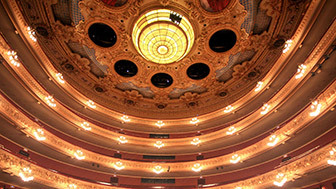 The origins of the Teatre Nacional de Catalunya ;are linked to the theatre tradition of the country, which has always been highly rich and creative, as well as daring, and this continues today. In the 1980s, Catalan society sensed that it needed a place where actors and directors could work freely. The creation of the TNC is also closely associated with the outstanding actor Josep Maria Flotats who, after returning from France in the 1980s following the end of the Franco dictatorship, took on a prominent role in institutionalising Catalan theatre and he became the first director of the new Teatre Nacional de Catalunya. Since it was created in 1996, the TNC has experienced many phases with various proposals, but it has always been committed to maximum quality and providing an area to promote other disciplines, such as dance, opera and puppetry. Today it is directed by Xavier Albertí with a varied, national and international programme. Apart from enjoying one of the performances staged, it is also worth making a visit for the architectural value of its avant-garde building, designed by the architect Ricard Bofill. L'Auditori is much more than a concert hall: it's a place to experience music.